Planning for potential business shocks, and how to respond effectively in a crisis, typically involves managing physical risks - natural disasters, industrial incidents, technological crises such as data breaches, malevolence, terrorism and other manmade threats. For banks and financial institutions, greater potential impacts can come from market, credit and operational liquidity exposures. Market risks are becoming particularly compelling as the financial sector is undergoing a period of sustained uncertainty, with conditions that rival the Global Financial Crisis of 2008. The International Monetary Fund, recently used its half-yearly global financial stability report to highlight the risks of a new financial crisis, warning that global output could drop by 4% over the next five years through a repeat of the market volatility seen during the 2008-09 recession. Throughout Europe, structural pressures are continuing to mount on the financial sector, where €900bn (£715bn) of non-performing loans (NPLs) remains on the books of Eurozone banks. After months of negotiations, the Italian Government has agreed to a €17bn bailout of 2 major lenders, to avoid a larger run on banks. Overshadowing these structural and geo-political issues is the challenge posed by needing to adapt to the threat of fast moving digital competition. Industry leaders estimate that 23% of their revenue is at threat from FinTech startups, as global investment in FinTech reached nearly US$17.4bil in 2016, up from just $2.1bil 2011. The interconnected nature of the global financial system means that impacts to any organisation or market can have a run-on effect to even the best prepared and managed players. Even if systemic breakdown of the sector can be avoided, wholesale impacts are unavoidable, so it’s wiser to plan for a response, rather than assume the worst won’t occur. These events can include natural disasters like earthquakes, industrial incidents such as oil tankers leaking, technological crises such as data breaches, and a range of other possible scenarios including malevolence, terrorism and other manmade disasters. For banks, potential risk factors include credit, market, and operational liquidity, business, and reputational exposures. An effective and well executed communications strategy is required to help minimise the impact. 1. Start with the plan — a written plan should be in place, which includes specific actions that will be taken in the event of a crisis. The key objectives during any crisis are to protect any individual (employee or public) who may be at risk, ensure that all stakeholders are kept informed, and that ultimately the organisation survives. Proactive planning is the cornerstone of crisis response, so seek advice from external specialists, as needed, to ensure that threat scenarios are adequately mapped, and the right tools and resources are in place for an effective response. 2. Identify and train a spokesperson — a key spokesperson needs to be identified, prepared and kept as up to date as possible to ensure that the media, staff, customers and the public are kept informed with a clear, consistent message. Ensure the spokesperson has the appropriate skills for communicating via the required channel – for larger organisations this is typically a hierarchy of communication leaders, appropriate to the situation or communications medium. Staff will have different capabilities for communicating in certain circumstances, such as speaking to large groups, addressing a camera, or responding to social media queries. Specialist media training should also be provided to help minimise the risks of important messages being misinterpreted during critical events. 3. Be honest and open — in our connected age it’s no longer possible to hope that information can be kept from the media or general public, so a policy of openness and transparency is essential to maintaining trust. This transparency must be projected through all communications channels: news interviews, social media, internal announcements, etc. 4. Keep employees informed — employees are the main conduit to keeping communications flowing between all relevant stakeholders, so it’s essential to keep the workforce informed with all relevant up to date information to prevent the circulation of incorrect rumours and potentially negative statements. 5. Customer and supplier communications — information on any crisis should reach your customers and suppliers directly from you, and not from the media. Part of the crisis communications plan needs to include these vital stakeholders, and how to keep them update throughout the event. 6. Update early and often — be proactive and early with sharing news, even when the whole picture isn’t clear. Its better to over-communicate than to allow rumours to fill the void. Start with summary statements on whatever is initially known, and provide updated action plans and new developments as early and as often as possible to stay ahead of the 24/7 news cycle. Make use of “holding messages” to inform stakeholders very quickly that the incident is under management, and quickly provide assurance that the organisation is in control of unfolding events. 7. Social media – ensure that all the channels that your stakeholders may be using are covered, not just the traditional areas in which critical statements were released, such as press releases or the company website. Nothing’s more damaging than incorrect information being live tweeted without your ability to see and respond with facts and the appropriate damage control. Send messages to your staff and customers in the way that suits them, whether that’s voice, SMS, Social Media, Rich Messages or email, to improve the rates of delivery. Knowing they will almost always have their mobiles close allows organisations to provide messages on all these channels. A leading retail bank with a reputation for effective operational resilience and crisis management faced a limiting factor to their planned expansion into new markets, due to the higher level of day- to-day operational risk. Their previous crisis communications system was manual and considered both tedious and time consuming. Whispir’s Unified Communications platform was selected to overcome these challenges, providing a system which helps in planning for and automating the incident management lifecycle. 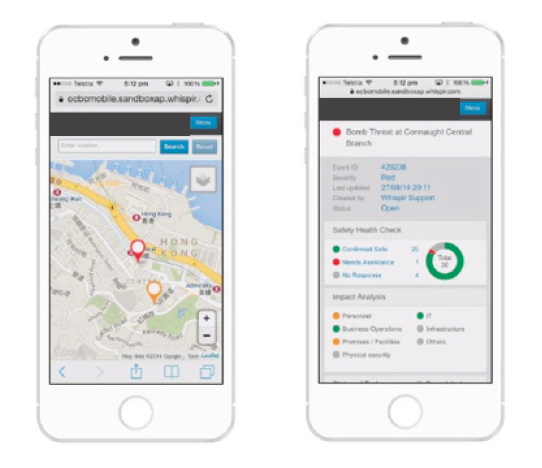 Event information is collated into the platform from staff on the ground, allowing incident responders to work collaboratively to evaluate, update, and categorize their response. 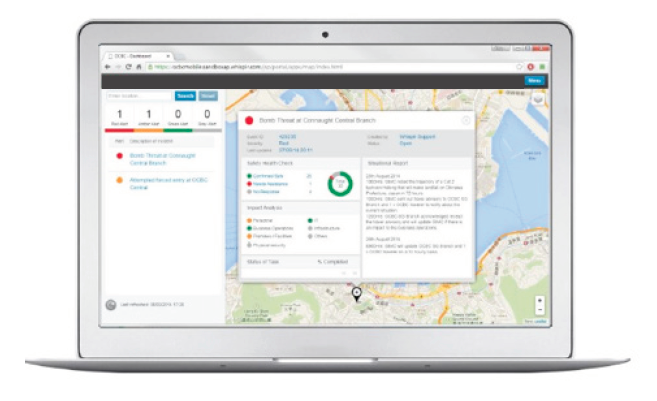 Incident Managers can target who to activate or inform by location, availability, and role. Crisis Communications paths are invoked, keeping relevant teams notified of the ongoing details of the Event to better inform ongoing decision making, and Real-time Dashboards can be accessed over any internet connected device, providing ongoing situational awareness to all relevant stakeholders. Crisis scenarios are inevitable, and without adequate preparation and management have the ability to escalate into critical events that can risk an organisation’s reputation, financial position, or ultimately the ability to survive.